The sweetbay magnolia (magnolia virginiana) is a lovely landscape tree that can grow up to 50-feet tall and 25-feet wide, but usually grow to only 20 feet in home landscapes. 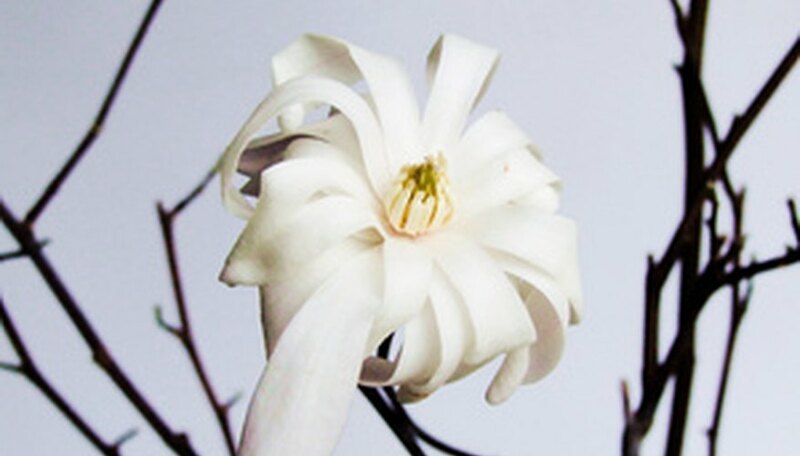 Sweetbay magnolias are mostly pest- and disease-free, with low maintenance requirements. The tree has upright-growing branches and blooms in small, 2- to 3-inch-wide, creamy-white flowers during May or June and sometimes through September. The leaves are evergreen or semi-evergreen in warmer climates, with dark-green upper surfaces and silver undersides. The blossoms have a lemony fragrance. Sweetbay magnolias grow best in USDA hardiness zones 5 through 9, tolerating winter temperatures that rarely dip down to -15 degrees F.
Water your sweetbay magnolia tree deeply to soak the soil around the roots two to three times per week during the first growing season after planting it. After the magnolia is established, water it once per week from spring through autumn. Feed your sweetbay magnolia once each year in early spring before new growth emerges with an all-purpose, slow-release tree and shrub fertilizer. Follow the dosage instructions on the label. Prune to shape the sweetbay magnolia tree when it’s young. Prune away all dead, damaged or crowded growth from the magnolia immediately after it finishes flowering. Amend the soil around the sweetbay magnolia once each year in early spring by adding iron sulfate, if you have persistently alkaline soil. The sweetbay magnolia requires acidic soil with a pH of 5.0 to 6.5. Plant your sweetbay magnolia in moist, acidic soil and in full sun to partial shade. Mix into the soil some leaf mold (humus) at the time of planting. Beware of scale insects infesting your sweetbay magnolia tree. If you detect scales infesting the twigs and foliage, treat the magnolia with an appropriate insecticide or horticultural oil according to the directions on the label.